The children’s bedroom is one room in the house that’s always in a state of chaos. And if you live in a small apartment, it can be pretty challenging to keep the children’s room spick and span! That’s why investing in multipurpose pieces of furniture in the children’s bedroom is the best way to keep this room organized and easy to clean. Also, pieces of furniture that serve a variety of purposes help maximize the smallest of spaces. Why get a standard children’s bed when you can choose a bed that comes with extra storage for toys, books, and collectibles? 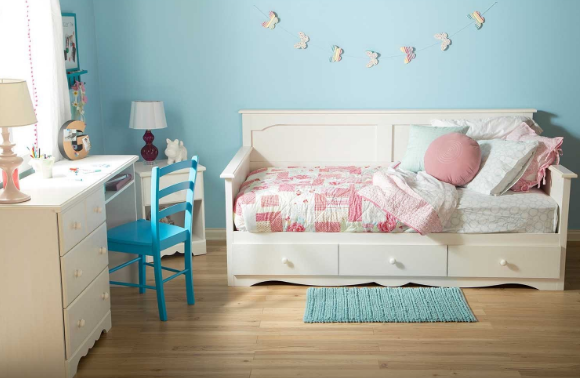 A bed that comes with extra storage is perfect for children’s bedroom with limited floor space. Thankfully, there are lots of kids beds that come with extra storage so you’re never out of options. 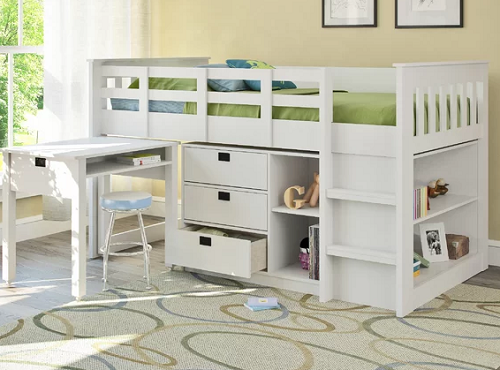 We love the Deion Twin Low Loft Bed, which comes with a bookshelf, cabinets, and a sliding desk. The raised bed makes for a cozy sleeping area while the extra storage keeps the rest of the room organized. The neutral shade and contemporary design of this multipurpose furniture will suit a variety of themes! Your kids might not admit it but study time becomes more exciting when they have a school desk of their own. Doing their homework is more bearable when they have a special spot in their bedroom to do it so a study desk is a must for the children’s bedroom. But don’t get just any study desk, go for a piece that comes with built-in cabinet or shelves to maximize every square inch of space in the room. Hayneedle’s Classic Playtime Bennington Desk makes a terrific study table. It has a roomy surface area + plenty of storage space. It also comes with drawers and cabinets to keep books and activity materials out of sight. Building a reading nook? If the space allows, try adding a daybed to make reading comfy and fun for the kids! A daybed will be extra useful once the kids invite their friends over. Go for a daybed that comes with extra storage like the South Shore Summer Breeze twin day bed. This country-style daybed has a sizable sleeping space and three drawers at the base. Use the daybed as a seating area during the day and as a bed at night. The storage drawers are large enough to keep big and small items alike, keeping clutter off the floor! If a daybed is too big for your kids’ reading nook, a bench with built-in shelves makes a great alternative. A bench adds extra seating to small rooms and the extra shelves offer more space for storing books! 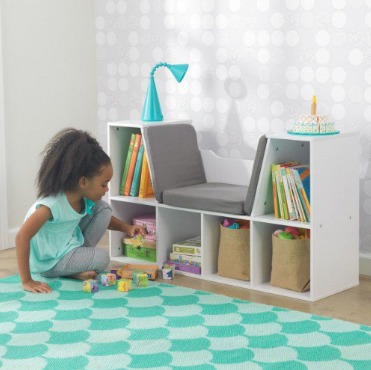 We adore the KidKraft bookcase bench because of its clever design. It’s sturdy, versatile and compact too! Set this multipurpose piece in the corner and your little one’s reading nook is almost done! Fill the shelves with colorful books, educational toys, and bins and your children have a new activity center. Cleaning after your little ones is much easier when you have a versatile toy organizer and bookcase! 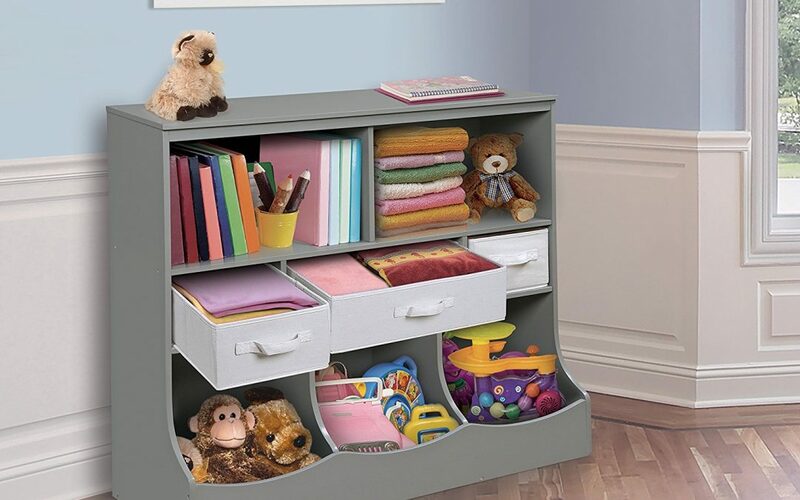 This 2-in-1 toy organizer is exactly what the children’s bedroom/nursery needs! It has a lot of room for your baby’s growing toy collection plus shelves for his favorite reads! We also love the rounded corners and the sturdy design, perfect for active babies! Since it’s a multipurpose piece, you don’t have to sacrifice precious floor space for a separate bookcase. This is a great furniture to get when you’re dealing with a cramped room because it is compact! The children’s bedroom is a clutter magnet! A compact yet versatile organizer is all you need to restore order in the children’s bedroom, especially for budding collectors. And we found just the thing! This pretty organizer comes with shelves, baskets, and bins. It also offers a slice of top shelf for displaying collectibles! This organizer works great to keep baby supplies organized and on hand. It has a beautiful design that will suit any theme or color scheme. One of the challenges of decorating a cramped children’s bedroom is fitting all the essentials in a limited space. If your children’s bedroom doesn’t have much room to spare for bookcases or a separate study area, consider maximizing the vertical space. 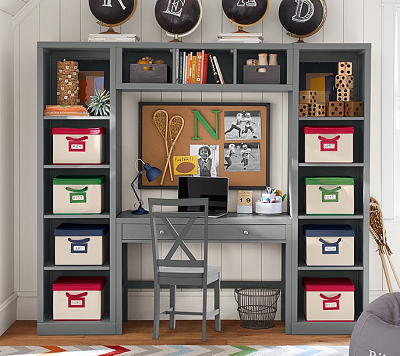 Use the walls to stretch what little storage space is left to create a cool study area for the kids! A skinny storage wall system with built-in desk provides much-needed storage space when you need it the most! This rubberwood storage wall system is masterfully crafted to fit small bedrooms. It comes with a variety of shelves, giving you plenty of room to store books, toys, collectibles, and other knick-knacks. The desk is just as substantial and it comes with a large drawer. 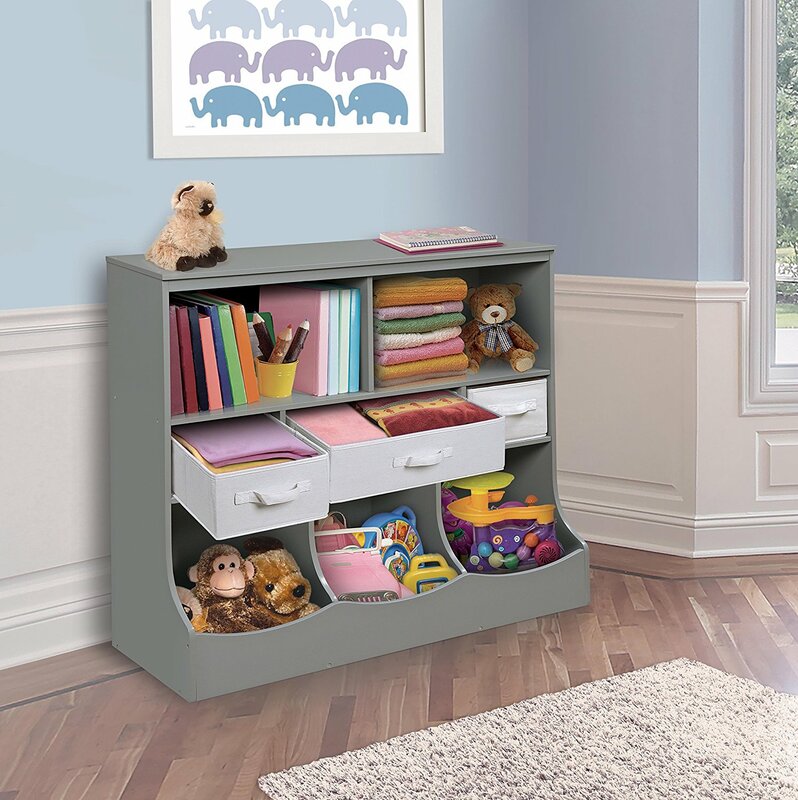 If your little one keeps misplacing his shoes or he made the habit of stashing them in all the wrong places, a cubby is just the thing you need to encourage your child to keep his shoes organized, not all over the place! This cubby has the perfect dimension for small kids. It offers ample storage space for little shoes while pulling double duty as a bench! The cubby is made from medium-density fiberboard with melamine exteriors so it’s quite sturdy. A sleek, compact and versatile storage piece is always a welcome addition to the children’s bedroom. If you’re looking for a cabinet that could pull double duty as a bookcase, consider this storage cabinet! This compact cabinet comes with six colorful bins to store small and large items alike. The dimension is just perfect for little kids. The top shelf offers room for displaying books or toys. You can also personalize this cabinet by swapping different colored bins to suit any interiors.